It seems like these days all I have is five minutes to do my make-up, so my "Everyday" routine has evolved and has become a lot more streamlined than it used to be. I'm up super early for work and get back quite late, so the products I use to create my daily look are simple, but effective. So let's get into it. 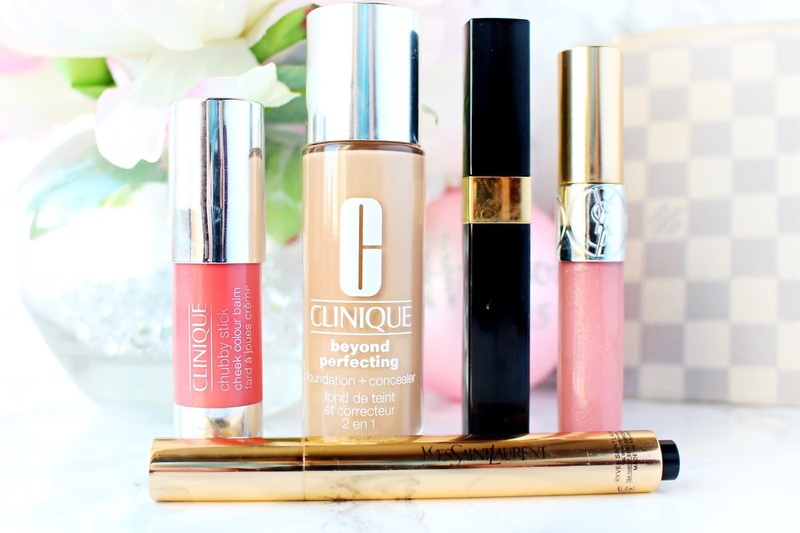 Once my skincare is all complete I opt for the Clinique Beyond Perfecting Foundation + Concealer (Full Review) which is the most perfect non cakey full coverage foundation with staying power to die for! It has quite a unique doe foot applicator, but actually this makes for super speedy application. Next up I dot the famous YSL Le Touche Eclat under my eyes to instantly brighten up my peepers. It's pretty fool-proof and even though it's coverage is pretty light, it manages to do some amazing transformation trick, which makes my eyes go from drab to fab! Now onto lashes... Since I was 16 I have been devoted to Chanel Mascara's and the Chanel Dimension De Chanel is a great way to define your lashes without a single clump in sight. When I'm on a tight schedule I always believe it's more important to add a pop of colour to your complexion over highlighting and contouring (which are luxuries these days) I'm absolutely obsessed with the Chubby Cheek Stick in the shade Robust Rhubarb, which is the closest I can get to faking that beautiful "Just been out in the cold glow" especially as I spend half my time in a busy office environment! Last but not least my five minute look would not be complete without a quick swipe of gloss to add a little bit of sass! I'm currently loving the YSL Gloss Volupte in shade 19. So that's it! I hope you enjoyed this post lovelies. I would love to hear about your go to products when you're on a tight schedule! I have kept looking at the Clinique foundation, I am such a foundation junkie. I own around 30 but I can't stop buying them!